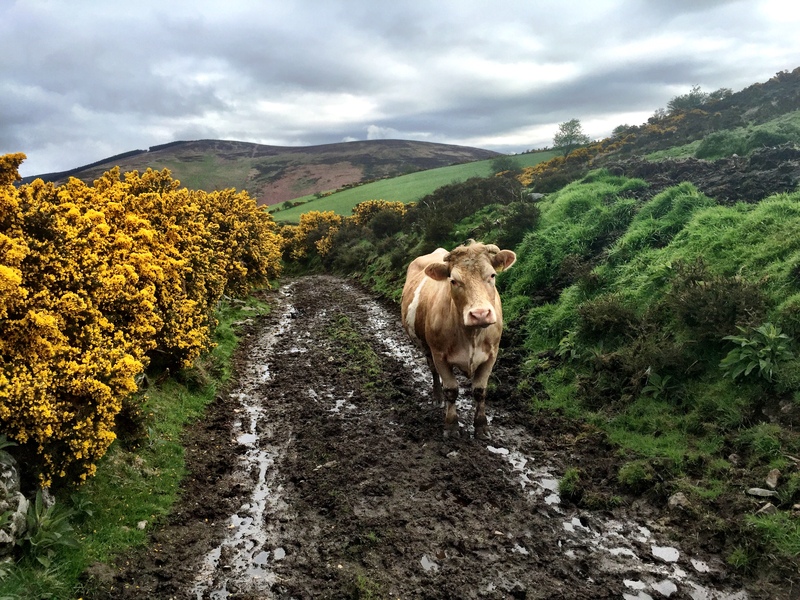 First 55km of the Wicklow Way now under my belt: 80 km to go, of which 30 will be ticked off tomorrow between Iron Bridge and the glorious Glendalough, another 30km on Saturday, as I walk home to Greystones and the final 20km from Glencree to Marlay Park on Sunday. The last two days have been intense ones in very mixed weather, some sun, mostly clouds, wild and blustery winds yesterday and the occasional drenching downpour, although never for long. I have become singularly adept at changing into and out of my waterproof outer layers and at deftly peeling layers of clothing on and off in a matter of seconds, and what two weeks ago was a constant irritation, has now become a routine wardrobe adjustment that I hardly notice. Great thing, practice. 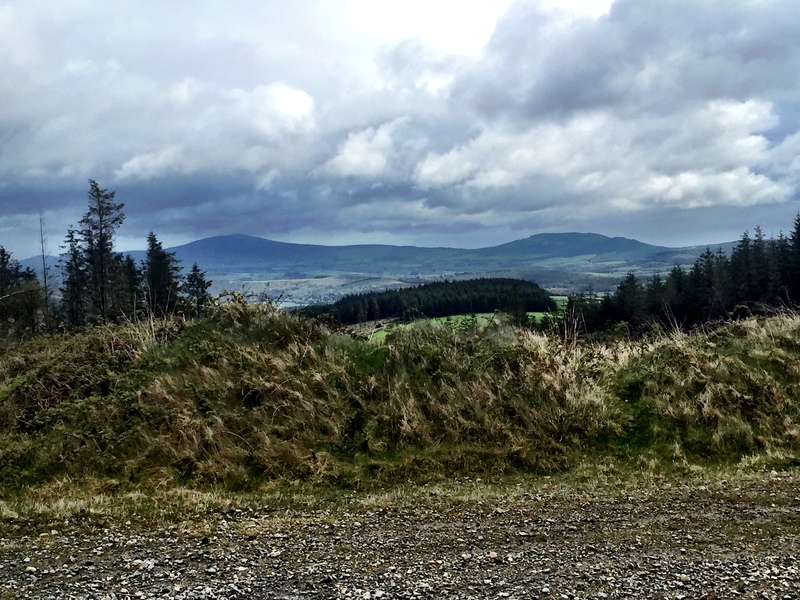 The terrain from Clonegal – winner, I am reliably informed, of last year’s prettiest village in Ireland award – at the official start of the Wicklow Way was on gently and then aggressively rising roads for the first six or seven kilometres and then a splendid passage through the first of two forests which took me over the first hills of the Wicklows and onto the storm-blasted tops. There were some heart-pounding pulls up grassy tracks as the Trail began demonstrating the steep climbs for which it is famous and at their summits spectacular views of the country I had passed through in the last days behind me. 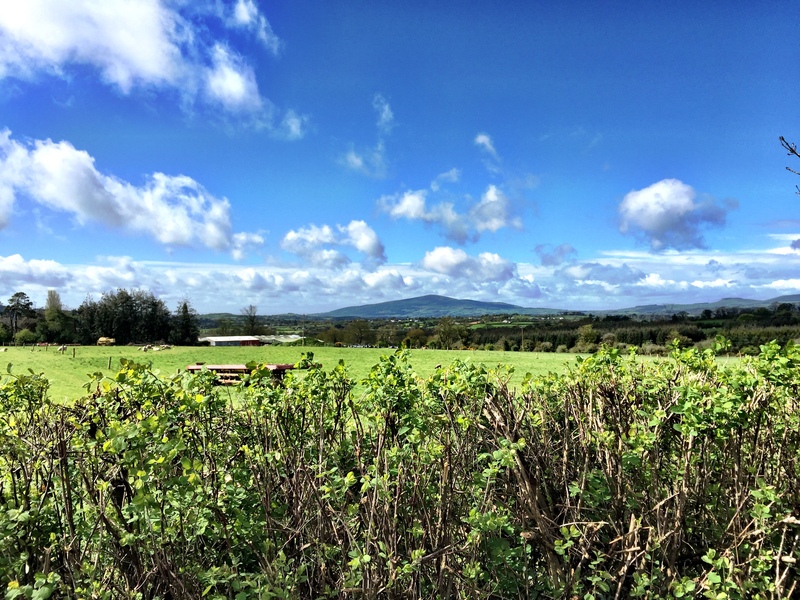 Brandish Hill and Mount Leinster were on full view, this time from the reverse perspective that I had enjoyed on Tuesday and I recognised my current hill as being the one I had looked across to only a few days previously. 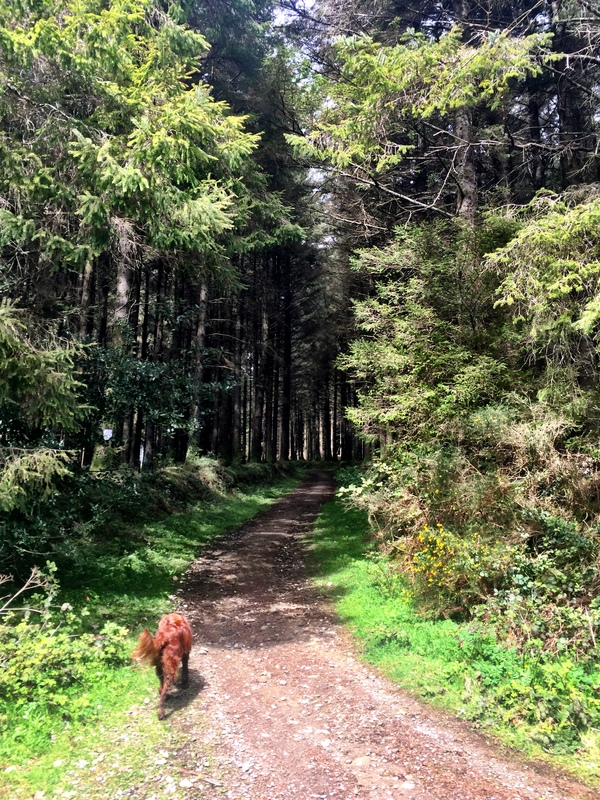 As so often over the past weeks, the forest and woodland sections of the trails, usually over or around hills or mountains, are relatively short interludes to the longer sections of road connecting the valleys or running along them and need to be savoured for their gentler treatment of feet and joints. 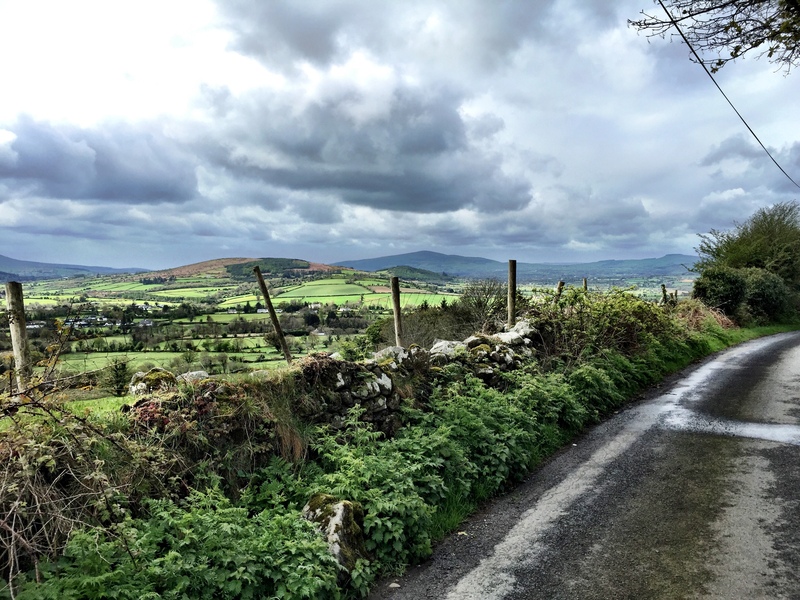 The route from Clonegal to Stranakelly, where Matt and Anne’s Lugnaquillia View B&B is situated, is perhaps half track and half road, but the trail today was much better proportioned, with only about 30-35% of the trail on metalled surface. This is an important statistic, as the quality of walking is significantly determined by how much time you have to spend pounding the tarmac: the more and the longer, the greater the pressure on feet and knees and the greater the overall wear and tear. Today’s route was glorious and just the sort of walking I had been hoping for on this section: miles of field tracks over steep hills, sweeping views of the Wicklows, as they slowly unfurled themselves before me, becoming deeper, higher and broader with every new valley traversed, as we headed ever closer to the big boys of Lugnaquillia Mountain and Corregaslegaun, whose sides we will travel across tomorrow. There were a few mighty pulls up long grassy tracks – one in particular I was waiting to experience as it shown as a vertical line across such tightly spaced map contours, that I could only imagine the ascent to be vertical. It wasn’t of course, but only just. I enjoyed two conversations along the road today: one, with a farmer whose land I was traversing on Ballycumber Hill, who informed me, when I told him that I had been walking from Waterville, that he had imported his best lambs from a hill farm behind the lake there (of which I had a photograph from my first day’s walking) and that this breed were particularly hardy and easy to handle. 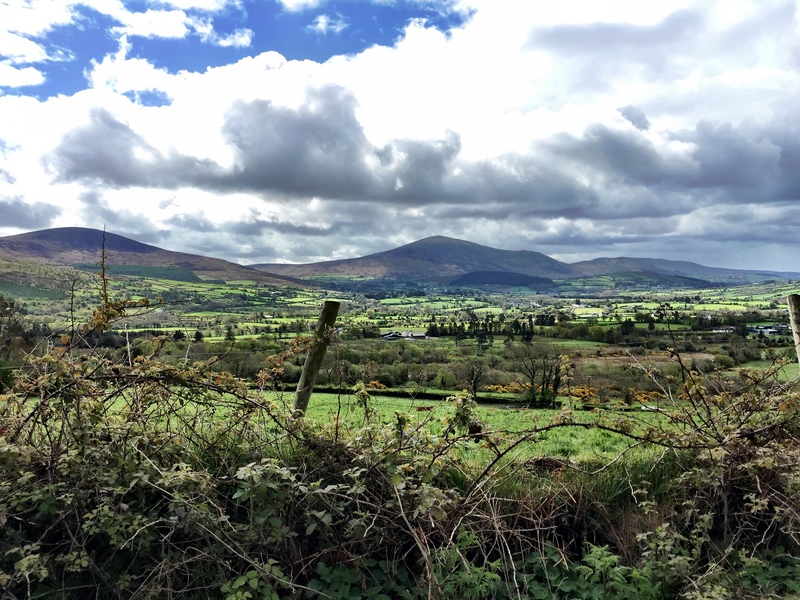 The second conversation was with a group of walkers on the far side of Moyne, one of whom, an elderly gentleman, took great delight in telling me, on hearing where I had started my journey, that his wife was born and raised in Waterville. He was not a little surprised when I told him that she was probably very hardy and easy to handle. He had to think about that for a minute before repyling, that indeed, on balance she was, but how the devil did I know that. 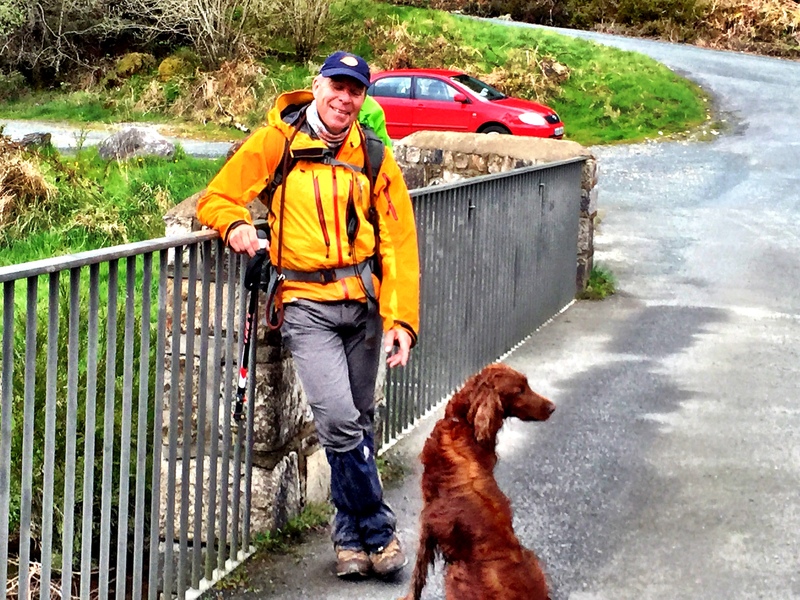 I could only smile knowingly and hint to him that one learns a great deal from travelling a country on foot. Today’s tour ended after six and a half hours at a place called Iron Bridge, exactly 30km from Stranakelly. 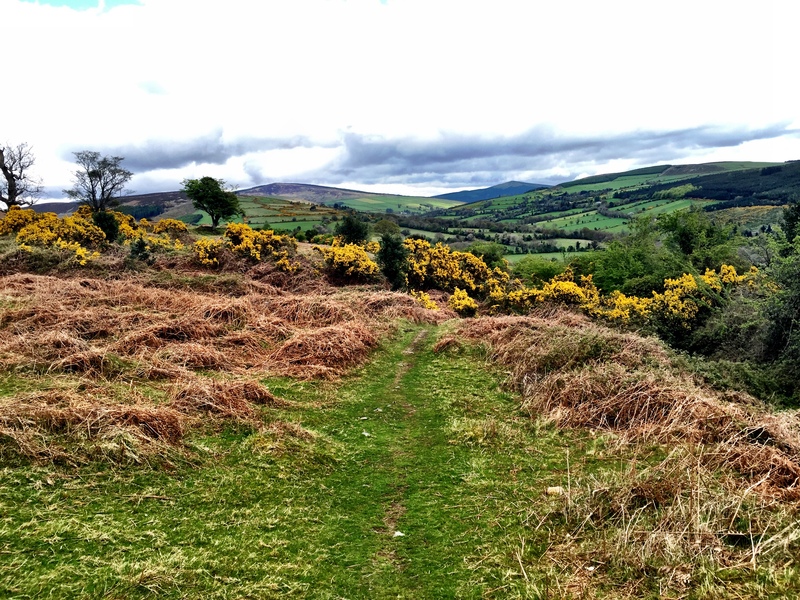 The ascent tab for the day came in at 1.234m which is more than third of the stated 3.200 for the whole Wicklow section. My guess is that we will have at least 1.500m tomorrow, which doesn’t leave very much for the final 50 kms. Either that or the official stats are erroneous. Iron Bridge was one of the locations that had embedded itself into my consciousness from the first moments of planning the trail and reviewing this section on maps and trail guides. 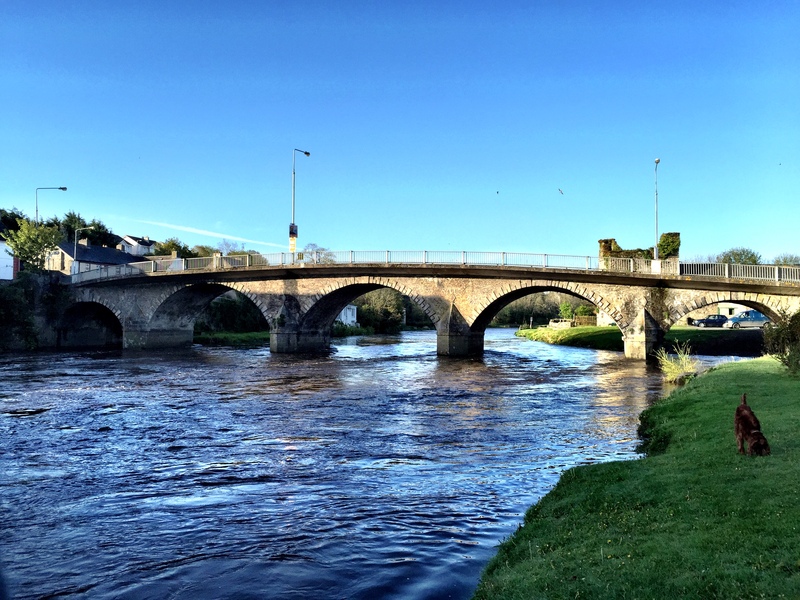 I had conjured up visions of a magnificent iron bridge spanning a chasm with a thundering mountain stream surging down the gorge below, a scene befitting the name and the importance of the spot as a marker on the Wicklow trail. My disappointment was therefore commensurate to the discrepancy between the size of the bridge in my imaginings and its dimensions in fact. To be honest, one blink and you would not even notice you were crossing a bridge at all, let alone remark upon the fact that there was any more or less iron used in its construction than any other piddling little bridge across a small, tranquilly flowing stream. Another notch on the scoreboard to reality and another nulle points to my preconceived notion (making the score right now look like FC San Merino versus FC Barcelona at half-time). Matt – angel that he is – was waiting to pick me up on the track just up road from Iron Bridge and drove Stella and me back to Stranakelly for our well-deserved tea and fire and biscuits. Both Stella and my kit were in urgent need of a complete hose down after our many kilometres of tramping through mud and cow-muck. Dog, boots and chaps are now drying in front of the fire, we have been fed on Irish stew and mashed potatoes and there is nothing more to do with the day other than keep awake long enough to see the first results of the UK election coming through and hope that the right party garner enough votes to a) form a working parliamentary majority and b) utterly confound the pollsters who have been predicting a hung parliament or worse. During the last week and a half, more or less since leaving Fermoy, my evenings have been pretty sad affairs. 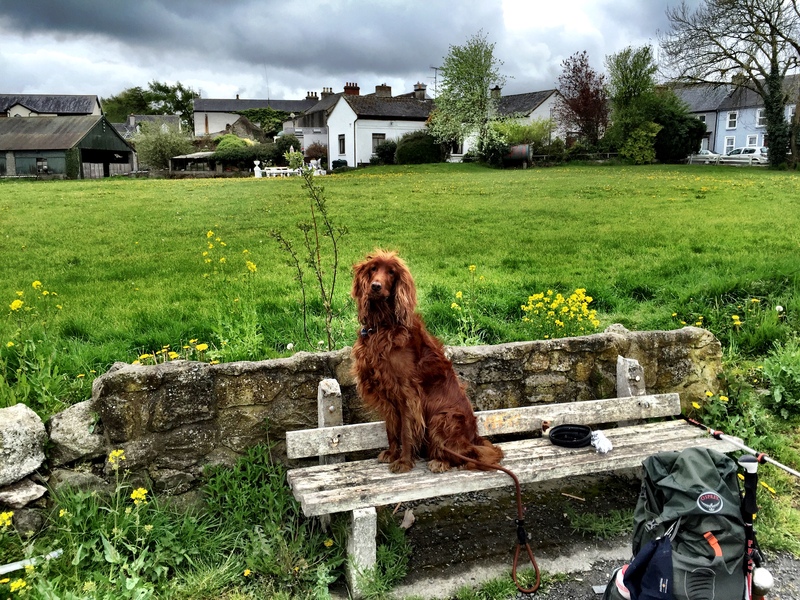 On the road with a dog in Ireland you are in a word homeless. Hotels won’t have you, pubs won’t have you and only very exceptional B&Bs are prepared to countenance putting you and your four-legged companion up in the same room. I have been lucky in that I have always found somewhere for us to stay and mostly the accommodation has been charming and my hosts delightful friendly and welcoming. I won’t have word said against them (pace downtown Thomastown). However, when it comes to getting fed in the evening I am usually reduced to nibbling the remnants of my packed lunch, as well, B&B doesn’t have a D for dinner in it, does it? Added to which, I am car-less (funny that) and my dog-friendly B&Bs have all been located at least two miles from the nearest village or town and unreachable by foot (at least, after a long day’s walking – I have never been that hungry). 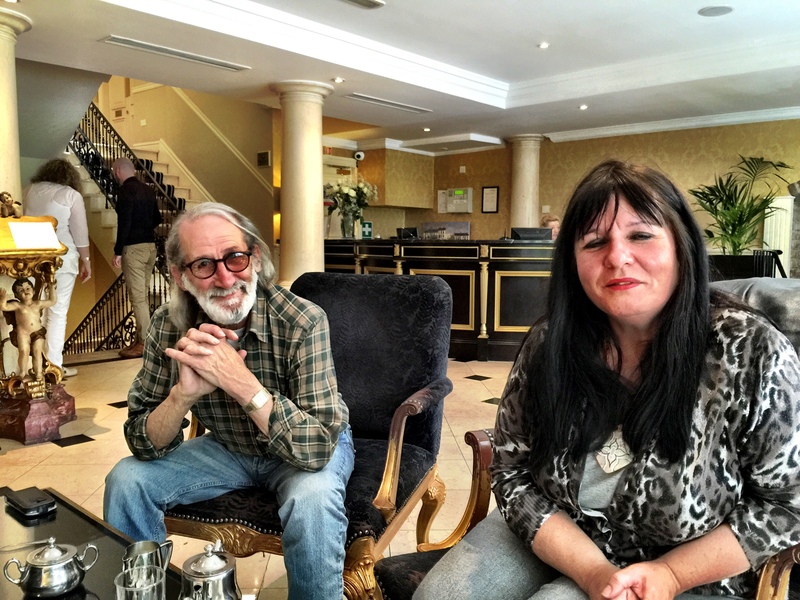 Relying on a taxi or hackney in those remote parts is out of the question and irish country taxi drivers are about as far down the friendly customer-oriented service scale, as it is possible to be without being a female german shop assistant. So my evenings are mostly supperless and short and consist of me and Stella winding down – if we are lucky in front of a fire, me with Macbook, Stella whimpering in her dreams of chasing sheep across endless fells. So it is a treat indeed when I end up at a B&B at the end of a good days walking with uncomplicated friendly and good-natured hosts, for whom nothing is too much trouble, for whom Stella is a welcome addition to their extended family (which includes an Old English Sheepdog and a bad-tempered cat) and who happily invite me join them for supper and then feed me, till I am fit to burst, with roast chicken, mashed potatoes, and rhubarb pie with ice-cream washed down with as much green tea as I can hold. Happy days. 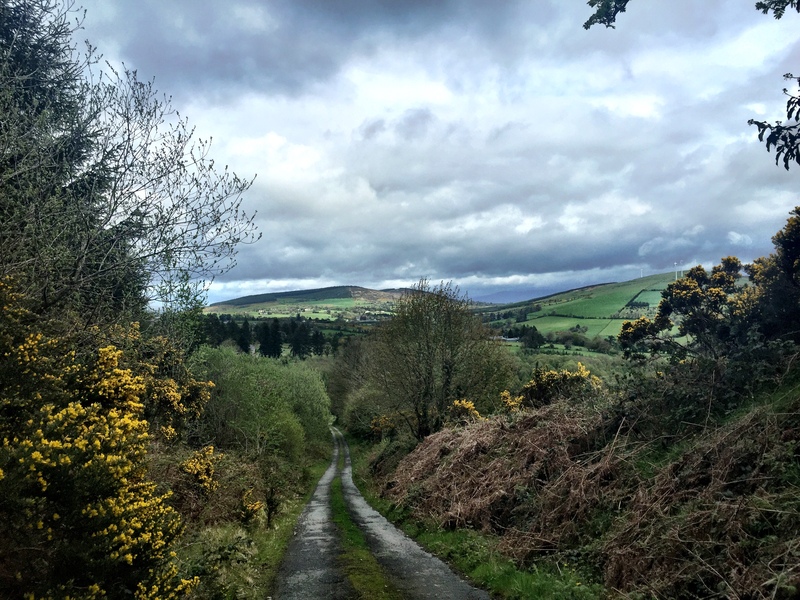 Matt and Anne run the Lugnaquillia View in Starankelly on the Wicklow Way and will be my hosts for the next two nights running me back and forth on to and from the Wicklow Way as I make my final way north. The view onto Lugnaquillia Mountain from my bedroom window is inspiring and I can make out my way from Thursday from where I stand. 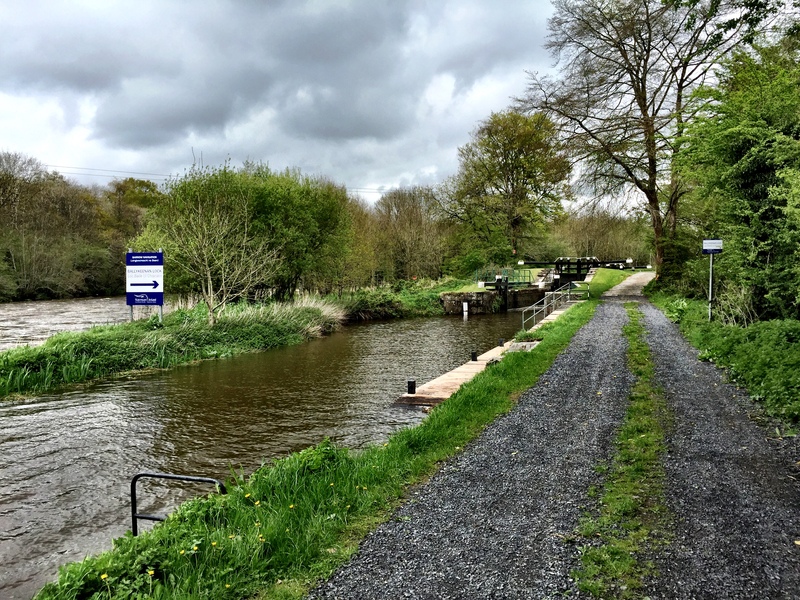 My walk here, or rather to Kildavin at the end of the South Leinster Way, started in Borris, where I left off yesterday, in pouring rain at around 0930. I had no idea what to expect, having only calculated that the walk could not be more than 23 kms, given that I had already walked 82 of the designated 105kms of this particular trail. And so it was – 23km from start to finish, most of them expended in a long climb up to the saddle which would lead up to the summit of Mt. Leinster. The first three hours of the four hour walking time were spent slowly approaching the magnificent Mt. 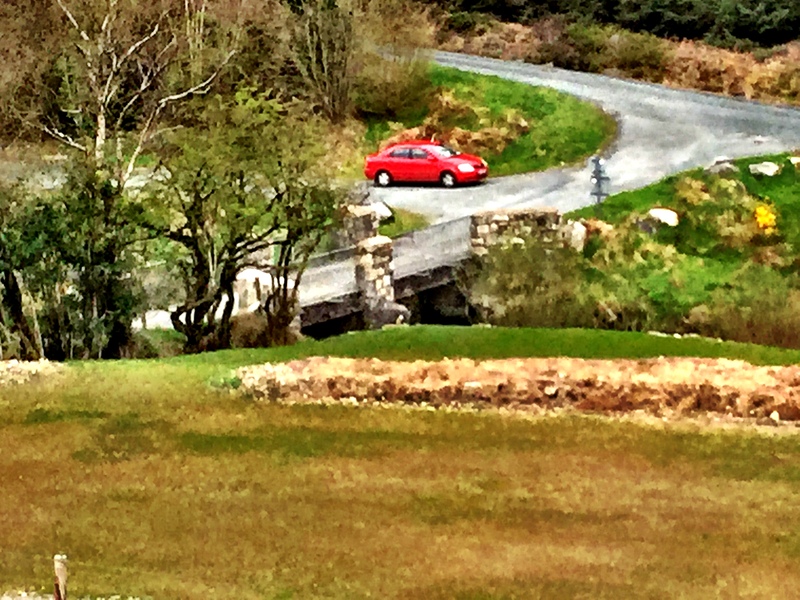 Leinster which I had first seen in the distance on Sunday as I walked with Mick Kelly to Inistioge. 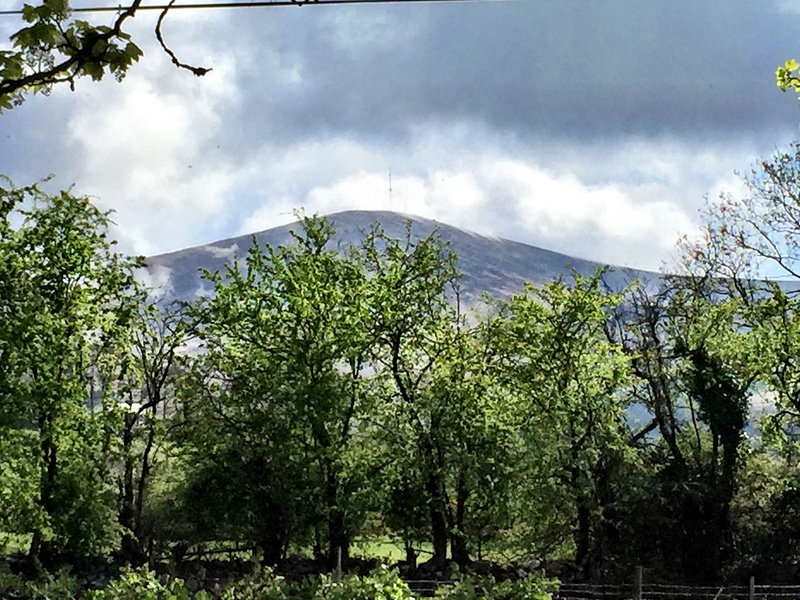 Mount Leinster is the highest peak of the Blackstairs range and form a natural border between the counties of Carlow in the West and Wexford in the east. The view of Mt. 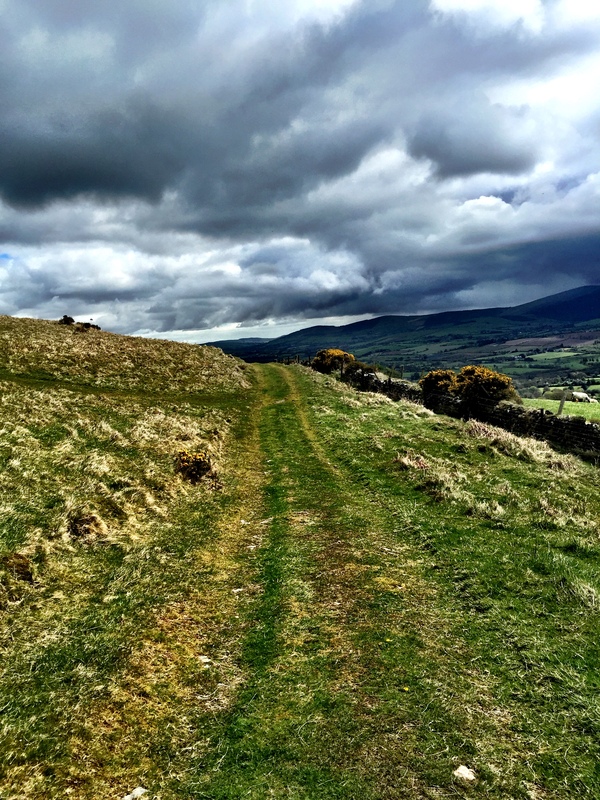 Leinster and by extension the rest of the Blackstairs dominated the walk as we wound our way on quiet country roads higher and closer by degrees. The weather became more clement as the morning passed and, pretty soon, I was overtaken by a sky more blue than grey and changed thankfully out of my waterproofs. Whilst the views were fascinating all day, the going underfoot was disappointing. We hardly left the metalled road at all – only on the section just before we dropped down from Brandish Hill into Kildavin – and by my reckoning almost 50% if not more of the entire Sounth Leinster Way was spent on tarmac roads, by far the most of any of the other trails we travelled on over the past three weeks. Also todays signage was a disgrace – I noted at least ten points at which a sign would have been essential to have a chance of following the route and several places where the signage only worked if you were travelling the trail from north to south, not the other way around. It didn’t impede me, as the route is well represented on the OS map, but for a walker relying on the signposting, it would have been impossible to navigate this section successfully. 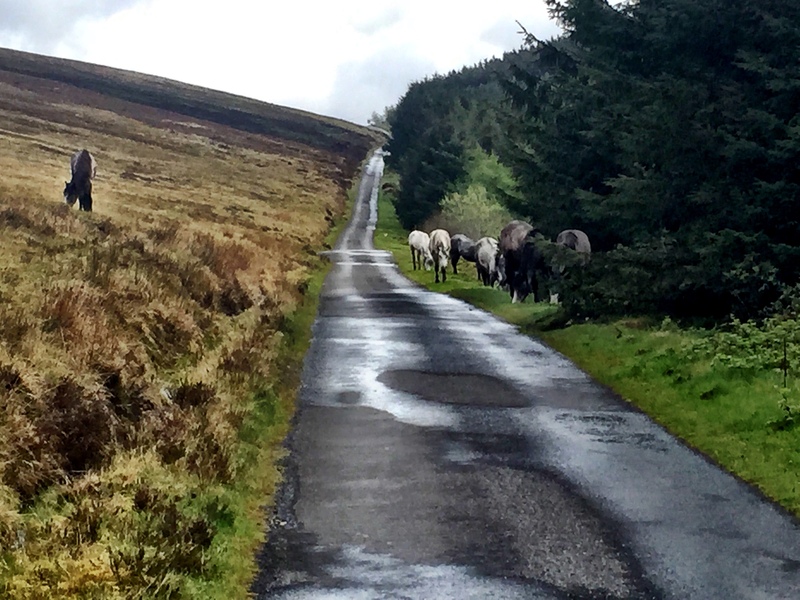 Tomorrow we back-track after breakfast to Clonegal and pick up the Wicklow Way at the source. We are on our way home! South Leinster in all its glory! My day ended yesterday in my less than salubrious, damp, joyless room in a dingy courtyard somewhere off the main street in Thomastown. I awoke at dawn and watched out of the window as the sky began to turn from orange to blue and another cloudless morning slipped out of its nocturnal chrysalis. Even my dank little cell seemed cheerful in the cold, sun-sparkled happiness of the morning. 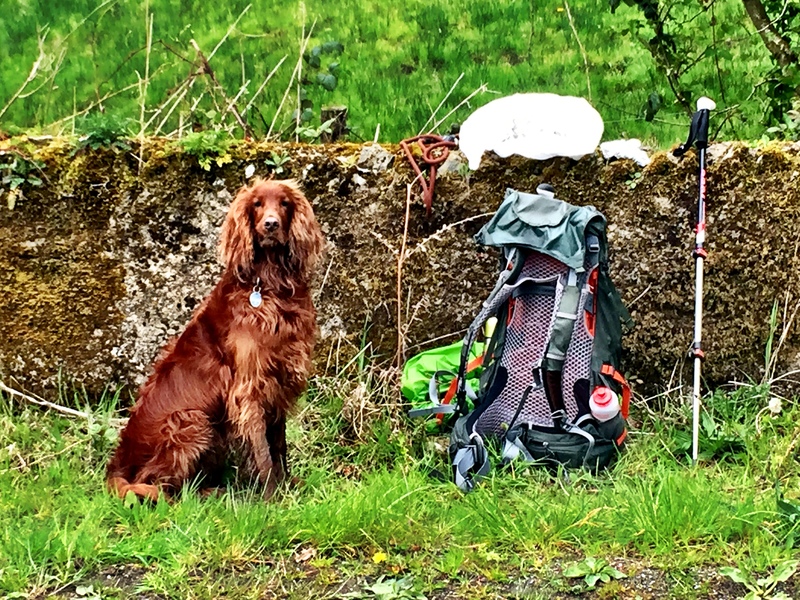 I packed my backpack quickly and efficiently, having perfected my routine over the last few weeks and deftly stowing the packages of clothes, washbag, cable holder, laptop, teabags, Stellas bowl and my walking equipment within five minutes. The hackney that I had arranged to pick me up to take me back to the trail at Inistioge was due at 0800 and I used the time I had to sit on the sad plastic chair outside my cell with a cup of green tea and the remnants of the chocolate cake I had taken with me from the Circle of Friends Café the previous afternoon, and let the sun warm my face as I waited. There are worse ways to start the day. 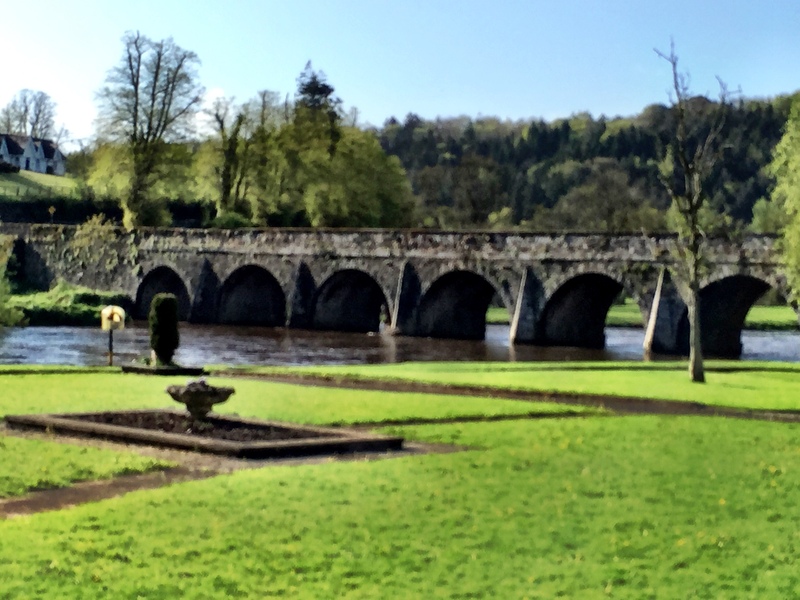 Inistioge was empty when we arrived there shortly after 0830. The cars that had filled the parking spaces in front of the village square yesterday afternoon and disgorged their Sunday afternoon families of walkers, gawkers and coffee shop tourists were mostly gone and the village was quiet and, I suspect, still asleep or at least just settling into holiday morning porridge. I wandered around the square admiring the ancient buildings, still in remarkably good repair, the perfectly kempt square, with its apple and cherry trees in full bloom and wandered why it was that some villages, blessed with similar virtues, were thriving centres of tourism, attractive to visit and with burgeoning local economies and others faded, loveless, poor and depressed. What was it that made the inhabitants of one village or small town, deck their gardens and window sills with flowers, keep their communal spaces clean and with evident pride, decorate and maintain their houses and others to neglect theirs? I have seen many villages and small towns on my walk across this magnificent country, many with almost identical properties: a location close to a gentle river, a splendid ancient bridge leading into the town, an abbey or monastary or castle in some advanced stage of ruin on the edge of the town and a small square or place in the centre with a few municipal buildings more or less grand that spoke of time when the market there thrived and the town was well-off and self-confident. Some of those towns have re-invented themselves, most of them have fallen into decay. 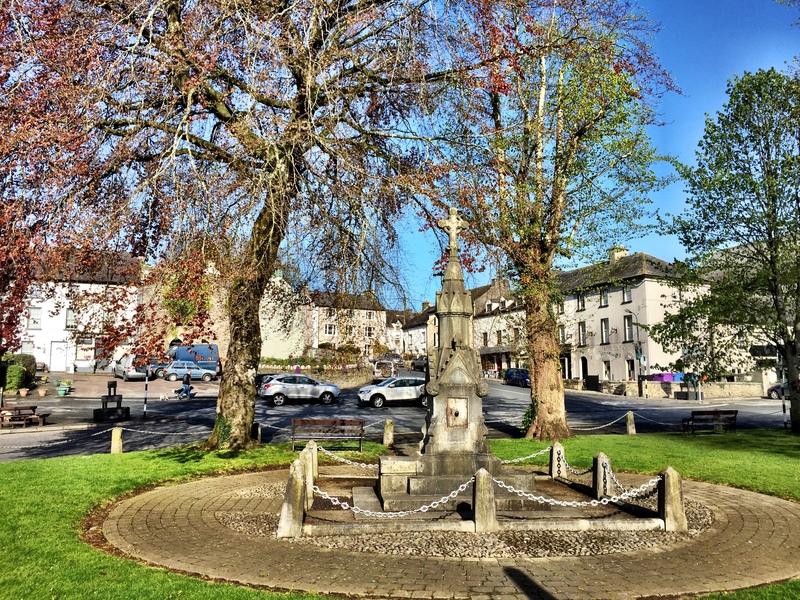 I will admit that Inistioge is very beautifully situated, but no less so than Clonmel or Carrick, and yet it has obviously thrived and adapted and the latter have not and that begs the question, why? Or rather, what? What has the one village done, deliberately or accidentally, that generated pride of ownership, collective investment in the appearance of the village and through that economic benefit and success that fed back into investment and pride, that the others could or would not muster the effort to do? Is it lack of imagination? Is it a collective acceptance of gradual decline? Is it a sense of helplessness or a lack of ability to think strategically about options for renewal? Europe is littered with once prosperous towns and villages who have lost their economic foundation either recently or many decades previously, whose infrastructure is decaying and whose children are leaving and whose fortune is spent? It is desperately sad to witness these declines and then all the more surprising – and heartening – to see how a successful version, reversing that decline can look. 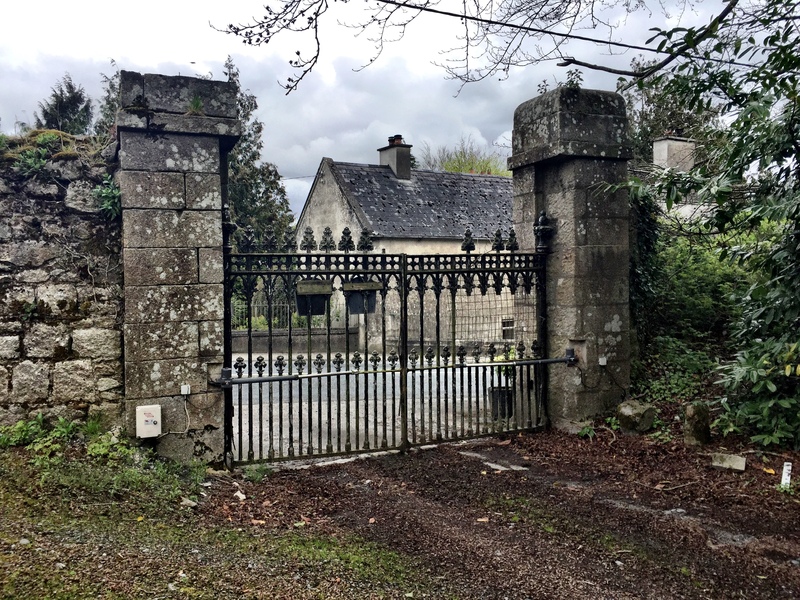 My walk today was amongst the most varied and enjoyable of the tour so far and quite redeemed my hitherto less than enthusiastic view of the South Leinster Way. From the first steps crossing over the River Nure on the bridge leading out of Inistioge, the steep climb up the bank on the opposite side through delicately greening trees, out into the fields and along a wonderful path with a view over Brandon Hill in the distance, the walk was full of surprise passages and rewarding views over the valleys and woodlands of the area. I climbed up through the forest approaching Brandon Hill, gaining height and with the height glimpses of the next valley around the corner to the north of Brandon, the glorious Blackstair Mountains, with Mount Leinster forming the highest point, came into view and dominated the horizon for the whole walk along the upper north side of Brandon Hill, which itself squats opposite the gracious Blackstairs peaks like a sumo wrestler waiting to engage. 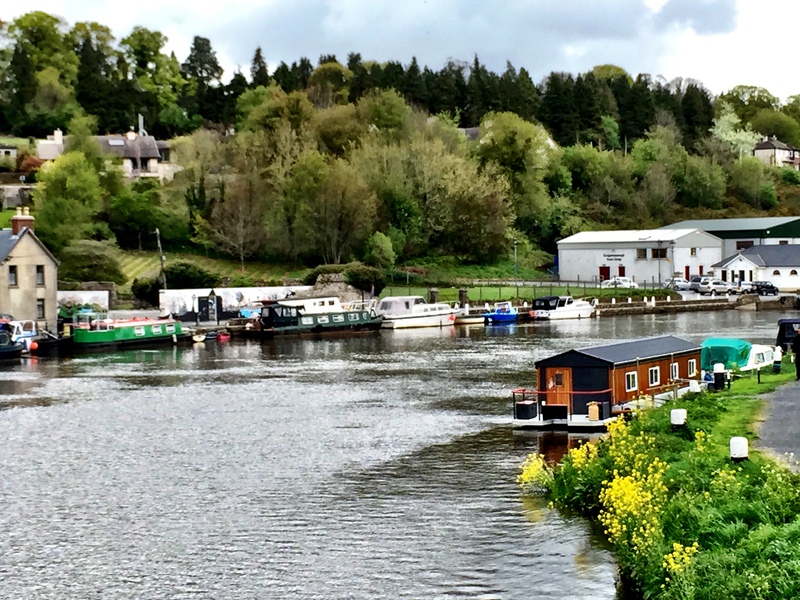 From the side of the mountain, the small town of Graiguenamanagh came into view and the walk took me down quickly into the heart of the village, built like so many here in the area, around a monastery on the river, this time the River Barrow. 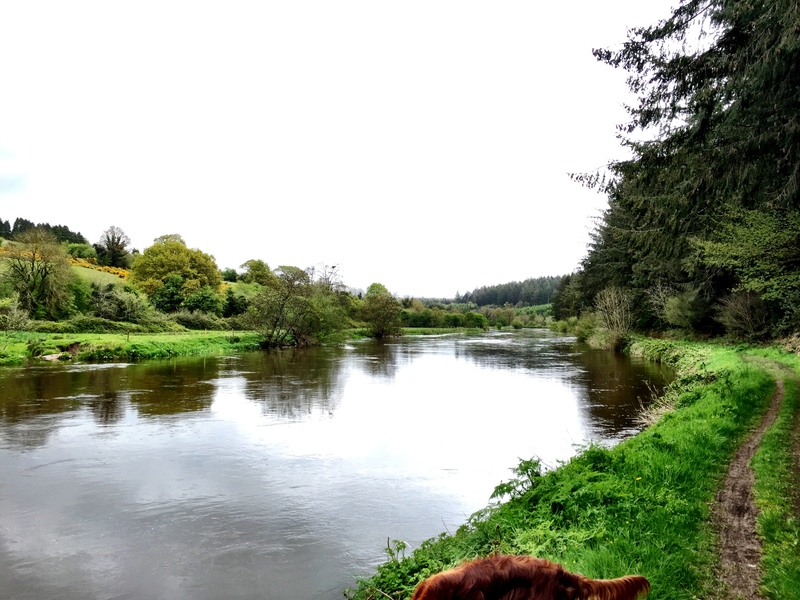 The trail then picked up a path on the banks of the river, which afforded some deeply relaxing and soporific walking for some 10kms on a grassy path along side the broad brown fast flowing river as it snaked in large sweeping arcs towards Borris, my destination for the day. My only excitement, in what was really a wonderful days walking, came at the very end as I decided to leave the towpath and risk a short cut, which I had divined on my navigation aid, and which led me along the banks of a smaller tributary river, through wild woodlands on a deserted path. I had a sneaking suspicion that I may have wondered onto private lands, when I saw a numbered peg by the river bank, marking a shooting position at the foot of a wooded bank to my right. These suspicions were confirmed when I was confronted by the first of a series of “No Trespassing – Private Property” signs and the full consequence of my detour made blatantly apparent when the path, now metalled, that I had been following ended at a locked and utterly unscalable wrought iron gate set into a high, but dilapidated stonewall, behind which was Borris High St. Brilliant navigation, but unforeseen obstacles to my progress. This little problem was solved by finding a point on the wall which was slightly lower than the rest and unceremoniously throwing Stella, my walking stick, her lead and my backpack over the wall, before scrambling over the top and dropping, less than elegantly, the two meters onto the pavement on the other side. Much to the amusement of a small group of american tourists, who had watched this little spectacle from the other side of the street. I am sure that one of them must have taken a photo. My afternoon was rounded off by a serendipitous meeting and an invitation to tea in the lovely Stephouse Hotel from Bernadette Phillips and her partner Stan, both writers and Bernadette an avid follower of my walk on Twitter, who were in Borris to visit Borris Castle, which was opening its doors to the public for the first time this year today. Bernadette is founder of New Insights for Change, a platform for initiating greater awareness amongst business practitioners for change and conscious leadership. 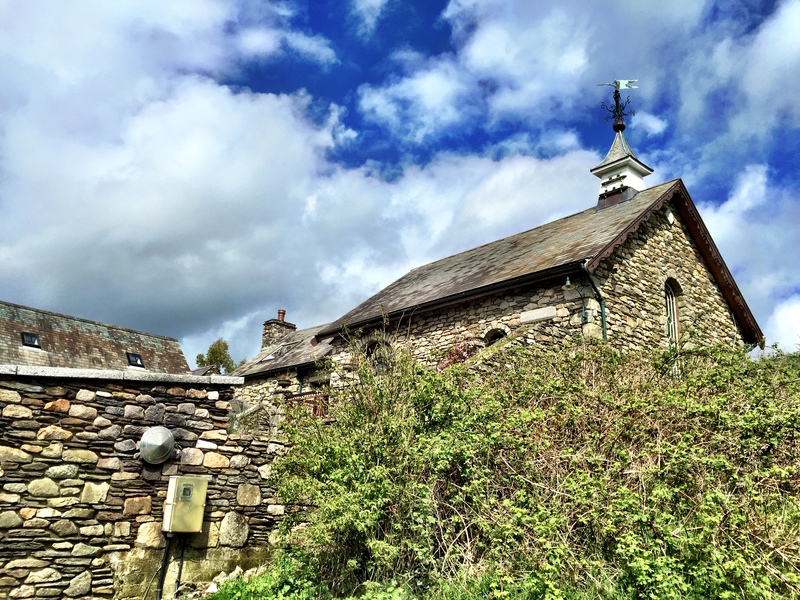 They were generous, welcoming hosts and our conversation and the tea and scones I was treated to were a delightful finish to a hugely enjoyable 30km walk.